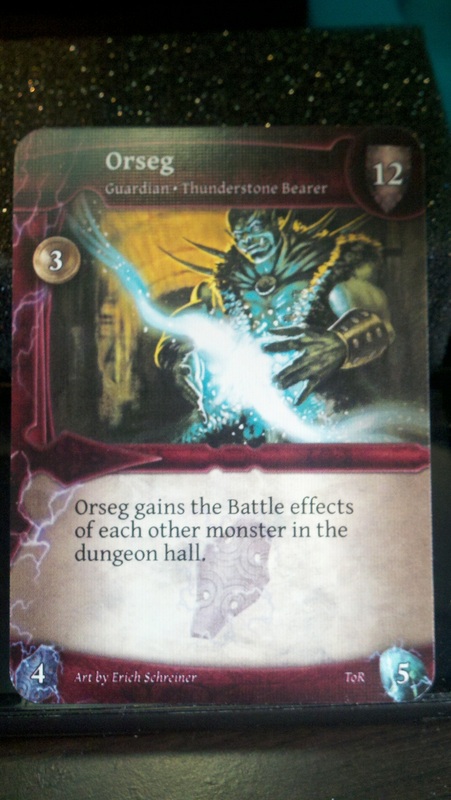 As you might recall, a while back I did a review of the base Thunderstone game. If you haven’t given it a read I suggest you do, it covers a lot that I won’t be regurgitating here. The short summary is that the game was fun although I did have a few quips with it, Thunderstone advance was on the horizon and my hopes were that it would iron out some of the game’s clunkier bits. 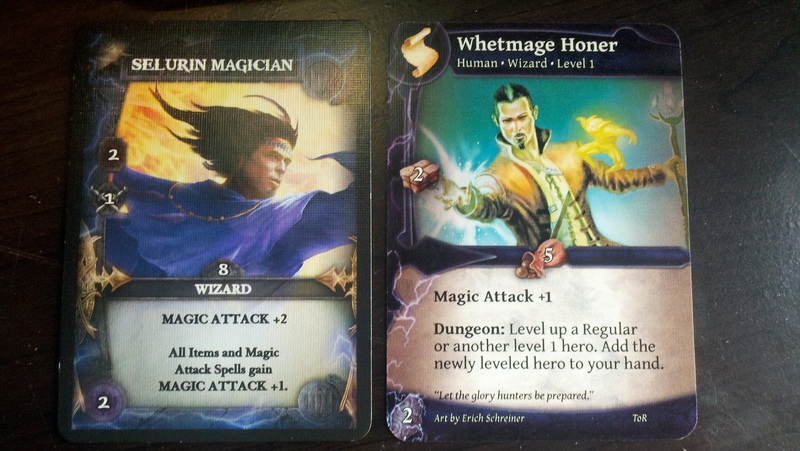 Well Thunderstone Advance has arrived and I’m here to report back on the changes and improvements to the game. Perhaps the biggest change to the game on a large scale, is that getting into the dungeon takes a lot less time and preparation than previously. At least according to Jeff Quick, Alderac’s lead guy on Thunderstone, during an interview I had with him just last week. This was (in my opinion) done primarily by increasing the overall effectiveness of your “milita” cards to a new type called “regulars” who are a bit more useful. Not only that, but you do have more useful starting resources for your deck in general, the game can also be set up so that low level monsters come out of the dungeon first. This stops the really big bad guys from coming out in the beginning of the game and completely destroying you or slowing the game to a crawl. Monsters all now have levels as which adds to the overall balance of the game and serve as a good indicator as to whether you can tackle them or not. There are a multitude of rules clarifications and codification for many of mechanics, which greatly reduces the verbose nature of some of the cards and smooths out gameplay quite a bit. The contents of the box also comes with a ton of dividers just as the first game did, but these are all meticulously labeled and color coded! The card layout itself has been changed immensely to allow for much better at-a-glance use, with more distinct icons and colors making for a lot less “wait, what does this symbol mean again?”. Speaking of cards, which Thunderstone has an abundance of, XP is now in the form of small plastic thunderstone shaped tokens. This is a really nice touch and helps detract from the confusion of keeping track of so many different piles of cards during the course of the game. Aside from smoothing out so many bumpy aspects of the game’s flow and design, Thunderstone Advance really brings some fresh ideas to the table that simultaneously reinforce the overall narrative flavor of the game as well as adding fun without additional complexity. Avatars are a nice touch that just hit the Thundestone scene, what they basically do is allow you to embody a certain RPG archetype (Fighter, Rogue, etc.) for the duration of your Thunderstone game. Each gives you a thematic bonus that you can choose to spend XP to level up as you delve through the dungeon. I did a short video on them which you can check out and decide for yourself if they are worth the 10$ price tag. Familiars are another new element in Thunderstone Advance, normally when you’d be able to choose treasure from the village you can instead choose to draw a random familiar. Brownies, pseudodragons, dire wolves, and imps are some of the familars you may wind up with, they remain in play and do not get shuffled back into your deck until you use one of their abilities. Their abilities also grow in power depending on the amount of XP you currently hold, but you mustn’t spend your XP to actually use them. Once again, a very nice touch and addition to the game that adds another layer of flavor without adding complexity. Horde Monsters are a new monster type that have been introduced which increase in power each time you fight them, this makes for a nice touch both thematically and in the progress of monsters getting stronger the deeper you delve. 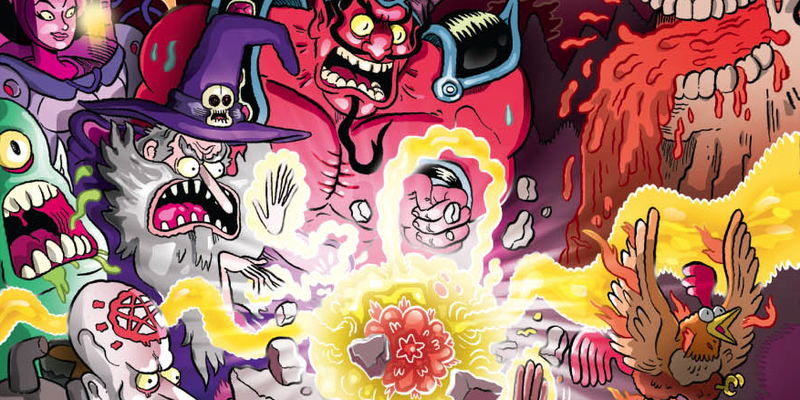 Curse Deck, formerly the Disease deck that gave out giant piles of static -1 bonuses, the new and improved curse deck promises to truly hamper your efforts. The curses still all give you a -1 to your attack but now they place you with a decision to make because they can be discarded if you fulfill some requirement instead of just using your turn to rest and destroying one. Discard two cards, lose xp, gold, etc are all bargains you can make in order to rid yourself of the curses. Preparing is a new option for how to spend your turn, in addition to resting, going to town, this 4th option allows you to ready yourself for battle on your next turn. When you prepare you discard any number of cards from your hand that you like, and place the rest back onto the draw pile from your deck, ensuring you’ll draw them on your next go round. It acts as a filtration process that can really put you in a good position for slaying bad guys down in the dungeon. The game board is a new addition, which provides you a nicely illustrated backdrop complete with labeled ‘slots’ for placement of all of your during the game. Not only does the board add a nice organizational touch, but it also adds a second level of complexity as it is double sided, one side being the dungeon and the other side being the forest. The forest is a sort of light or beginner friendly alternative to the dungeon, as it has light penalties that are far less harsh. 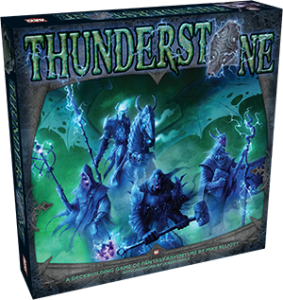 Thunderstone bearers now replace the Thunderstone card, it adds quite a bit of challenge to the finale of the game and also keeps you from feeling like “we delved through dozens of evil monsters to come pick up this rock?”. You’ve got to fight for it, and boy do these bearers bring the pain! Thunderstone Advance really nails what a deck building game should be, and it does so with flourish and the trappings of an awesome dungeon crawl. Rife with amazing artwork and quick gameplay, if you’re into deck building games and you’ve yet to check this one out you’re seriously missing out. The difference between Thunderstone and Thunderstone Advance is like night and day, definitely a great game to jump into the series with. I can’t speak for Thunderstone vets but I’d assume they welcome these changes to the game with open arms, as the refinements made here really bring the game to top notch status in my opinion. If I had only one thing to say that hasn’t changed from my original Thunderstone experience it would be that the game still seems to lack many elements of interactivity. I’m sure there is a conscious game design reason behind this, but I still can’t help but feel at times that I feel like I’m playing multiplayer D&D themed solitare. There are rules for solo play too, I might add, which I’ve yet to try. It’s just that I could honestly care less about what my opponents do with their turn, and it kind of bums me out. Occassionally someone will have a rogue hero that causes me to lose a few gold or something, but nothing that ever generates any sort of rivalry or tension between players. I just wish there was more of this in the game, or at least the option for more of this. Maybe some Thunderstone junkies out there can advise me on how to do this? All personal preferences aside, Thunderstone is a great game. If your’e into deck building games or if you’ve never even played one I’d say that this game is a great place to start. The number of approaches you can take going into the game seem to expand every time I play it, and if you want to check it out before taking the plunge, you can always download the rulebook and give it a look over or check out the facebook game. Until next time everyone, delve boldly! Help!! I heard about this on the Haste podcast but I am lost as to which is the first for me to get? 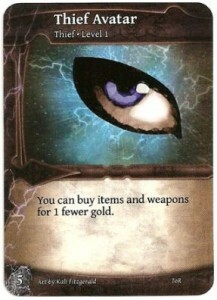 I wan t the new Thunderstone Advanced game but on Coolstuffinc.com there are a bunch of them. Also, I love expansions to games, will the expansion to the original game still work with the advanced game? 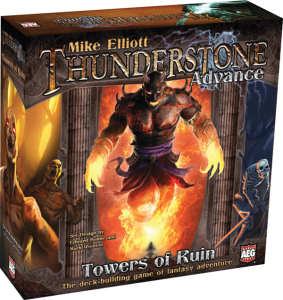 Thunderstone Advance: Towers of Ruin is the proper name & expansion title for this one! Yes, previous games and expansions will work.